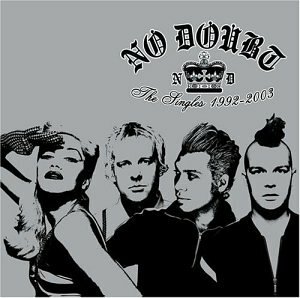 It has been almost 17 years since Gwen Stefani, Tony Kanal, Tom Dumont and Adrian Young came together to form No Doubt. Back then, they were four ambitious teenagers from Anaheim, California who enjoyed music and wanted to make it big. They finally got their music deal in 1991. The band held on and in 1995 they went to the top of the charts with their break-through album, "Tragic Kingdom" featuring the big hits "Just a Girl," "Sunday Morning," "Excuse Me Mr.," "Spiderwebs" and "Don't Speak." People started to take notice of them and they went on to record three more albums. Their latest album was released in November, "The Singles 1992-2003" which contains 15 of their biggest songs as well as a brand-new one, "It's My Life." Since the band needed to come out with a new song for their greatest hits album, they thought why not cover a song they were influenced by when they were growing up. They thought it was the perfect ྌs song. The album has a California sound mixed with a Jamaican beat (it was actually recorded on the island). It has every big hit that No Doubt has ever had, even their oldest from their first album, "Trapped in a Box." Each track is a little different and reminds me of the early works of Sublime, which happens to be one of No Doubt's influences. Both grew up in Orange County, California and have similar sounding music. I would recommend No Doubt to anyone who enjoys Sublime and California-sounding bands. Each has a message: "Simple Kind of Life" describes someone who wishes for the simple life but finds that nothing is simple and life is filled with challenges. This album captures the variety of emotions that the band has experienced during its 17 years. They say this will be their last release for a while because they want to go solo and then get back together. I really enjoyed this CD because it shows you everything the band has been through. I like that you can see how the band has matured over the years. They have only gotten better as they have gotten older. The CD shows you the true roots and the background of the band and how they got started. Two thumbs up! Death Cab for Cutie - "Transatlantisim"